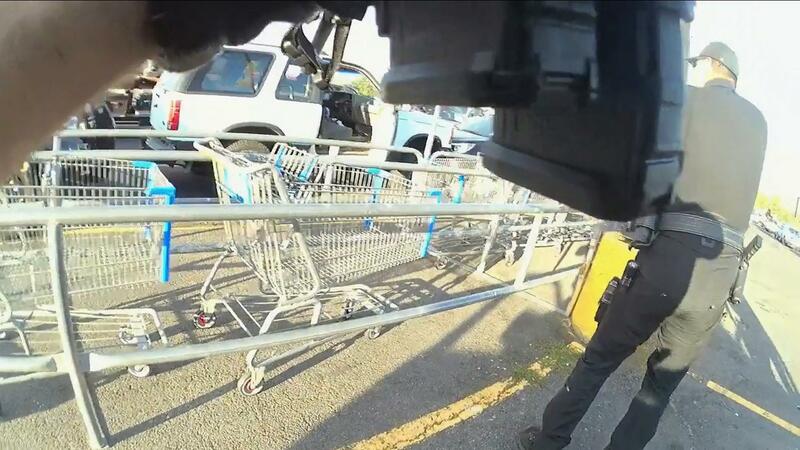 UPDATED: Thu., Feb. 22, 2018, 9:25 p.m.
Police released body camera footage Thursday showing the moments leading up to a fatal police shooting in the Shadle Center Walmart parking lot late last year. Chad Cochell, 34, was shot multiple times by two Spokane police officers after the stolen Ford Explorer he was driving was boxed in by police on Oct. 4 – two days after it was stolen from 41-year-old Kerry Arnold in northeast Spokane. Police say Cochell shot Arnold twice during the earlier incident. Arnold was hospitalized and underwent several surgeries. The video released Thursday shows the shooting in the Shadle Center parking lot, as well as the events immediately preceding it, from multiple vantage points: several Walmart surveillance videos and body camera footage from Officer Ryan Smith, who shot Cochell once with a rifle. Smith’s partner, Officer Darrell Quarles, fired at Cochell twice with a shotgun, striking him both times. His body camera was not turned on until after the shooting, and it captured 60 seconds of video but no audio. He was standing inches away from Smith when the shots were fired. County prosecutors ruled the shooting justified on Jan. 29. The video from Smith begins with both officers in their patrol car after hearing over the radio that the stolen vehicle had been found. According to a news release, Officer Mark Brownell spotted the stolen white SUV at 4:48 p.m and its location was broadcast departmentwide while police staged in the parking lot and prepared to confront Cochell. Apparently spotting the vehicle, Smith and Quarles speed up, park by its passenger side and exit, guns drawn. As they do, a woman exits the SUV with her hands up. Several officers shout at her to get down on the ground while an officer and K-9 approach. Quarles and Smith then walk up to the passenger’s side door, with a shopping cart rack directly in front of them. Cochell can be seen in the driver’s side with a pistol pointed at his head. “I’m gonna – I gotta shoot him,” Quarles yells, shotgun pointed directly at Cochell. “Hey, there’s kids behind him,” another officer yells. “I’ve got a shot,” Quarles replies. “Watch crossfire, watch crossfire, watch crossfire,” Smith says a second later. Cochell, meanwhile, continues to point the gun at his right temple. “Put it down now,” multiple officers yell. A moment later, Quarles fires, followed by shots from Smith. Quarles fires again while the woman passenger screams. The officers stand in place for a few seconds, their weapons still pointed at Cochell. They remark that his gun is in his lap, but he’s still breathing. Video of Cochell, taken a moment later, has been redacted due to its graphic nature, according to police. Quarles and Smith stay in their positions for about two minutes, before officers approach with a ballistics shield from the other side. Remarking on that delay, Capt. Brad Arleth, speaking at a news conference, said that until officers are sure they’re no longer in danger, they’re going to assume they are. “It looks like a long time in the video, but if you time it out it’s only about two minutes,” he said. Published: Feb. 22, 2018, 5:41 p.m. Updated: Feb. 22, 2018, 9:25 p.m.